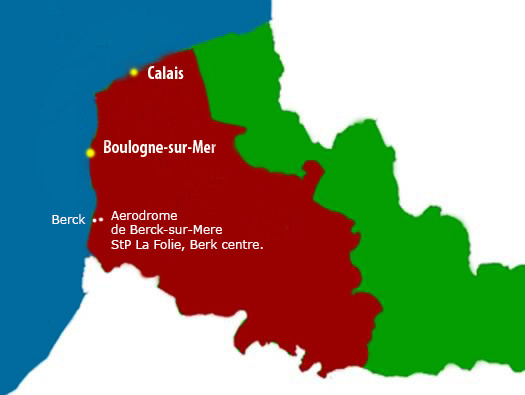 StP La Folie, Berck centre., K.V.A D2. StP La Folie, Berck centre. Situated on the D940 in woodland to the east. Very hard to photograph but better seen by the eyes. If you like . With the aerodrome on your left, the wood is on the right, as you see its quite thick and I am not sure if you can enter the area or not?. Unfortunately this plan may pre date StP La Folie so I have added red dots to show where the bunkers are and another slightly south. 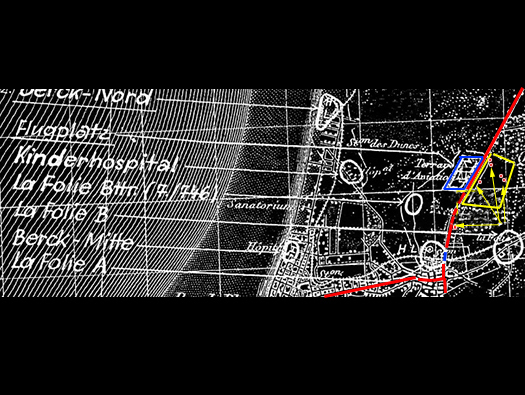 The blue square is the aerodrome. German map of NE France. Kabelbbrunnen as you see in good camouflage. These cable bunkers were a string of connections between the network of communication cables. Radio could be listened into and codes could be broken. By using telephones there was no need for codes and the enemy could not listen in. The Germans did use the civilian telephone network but also had their own system. When D-day started the French resistance cut the German cables all over France and on many occasions disrupted German communications and thus making them relent on radios which the Allies had managed to break most of their codes. A double whammy. 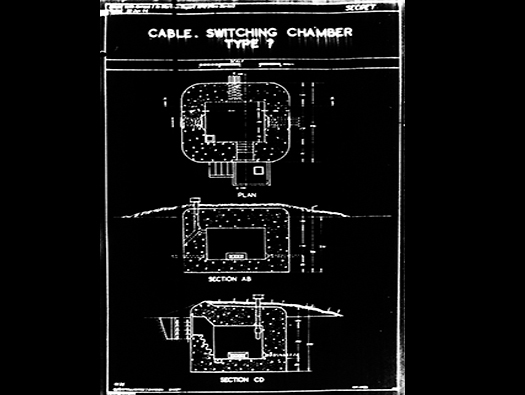 A closer view of the cable bunker. The possible network of cables from the red circles the gun batteries and the defence areas to the main north south cable and probably connected into the railway cable network (black line). Manhole cover for the connectors. 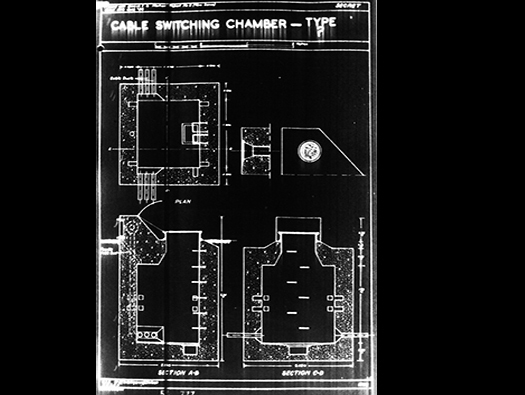 This is a British intelligence plan of a Kabelbrunnen. No idea which it is. One of the Vf bunkers. Another view of the above Vf bunker. Semi permanent bunkers 80 to 10cm thick. Vf7b is exactly the same as a Vf7a but with thicker concrete making it a shell proof type. A second type of Kabelbrunnen. 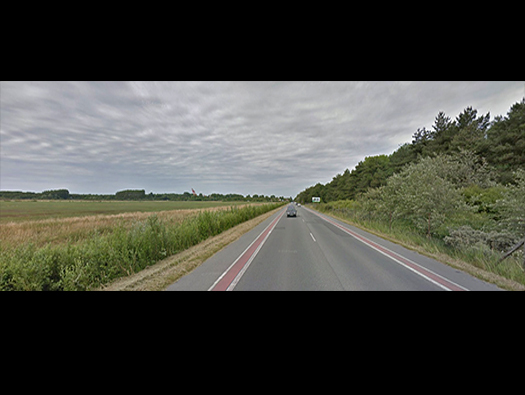 This is a larger square type I and around Berck we saw five cable bunkers the most we have ever seen in one area..
Another intelligence plan of what may be this bunker?. RAF bombing photo This maybe a USAAF bombing run on the battery StP 10 Berck Nord Berck Bellevue H.K.B. 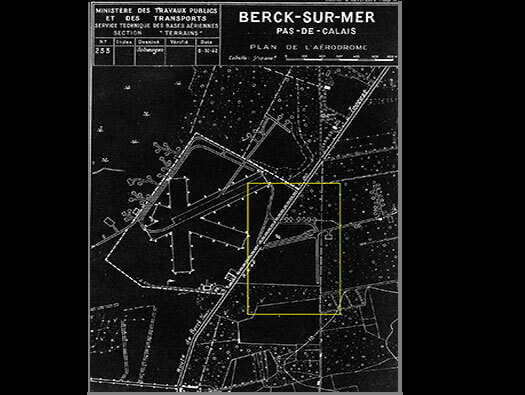 The aerodrome can be seen (bottom right) and the yellow circle is the area of StP La Folie. 1952 Plan of the Aerodrome. Aerodrome to the left of the red road and the yellow square the area we are looking at. 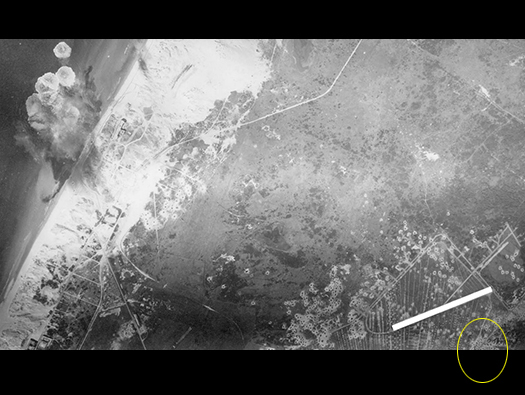 A 1947 air photo and the white blobs are bomb craters not yet filled in. The aerodrome was used by the Luftwaffe during the war. The aerodrome was used by II./JG52 and III./JG53 Luftwaffe Bf 109 in 1941. A Bf 109 of III./JG53 Luftwaffe.